Experimental tank destroyer developed on the basis of the M3 tank in the spring of 1942. The vehicle never entered mass production, nor saw service. 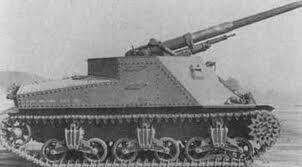 The T40 is basically a M3 Lee without its small turret and roof armor, but with better guns, camouflage values, and a more ideal placed gun mount. The Hetzer is a better brawler and ambush tank, while the SU-85B is a better sniper. However, the T40 is very versatile and easy to play. It can fight at any range as long as you know how to avoid getting hit. Its top gun is excellent for tier 4 and is arguably the best mid-ranged weapon of any tank at its tier . The T40's role on the battlefield is mostly determined by the guns you use. With the 105 mm AT Howitzer M3 it acts as a short range ambusher that can one shot most opponents in tier 4 matches. Though, you should take a more supporting approach in higher tier matches, as the HE damage greatly diminishes against better armoured tanks. With the 57 mm Gun M1 L/50 cannon it can be used as a sniping anti-tank machine gun over medium to long ranges. The 76 mm AT Gun M1A1 gun is widely considered as the best gun for this tank. It combines high penetration and a short aim time with a decent rate of fire and alpha strike damage. Its only drawback is the mediocre accuracy which diminishes its long range performance considerably. But feel free to spam even at those long ranges if you're in a good position, as your shells are cheap and plenty. The key to play this tank effectively is to hide your rather large body from incoming shells. The T40 excels at hiding behind wrecks and shooting over hilltops. 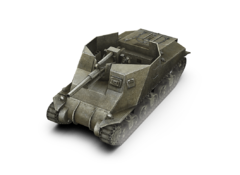 In addition, this tank can become a proper killing machine if played in a defensive like manner correctly, keeping hostile players at bay as team mates push forward on other fronts or are rushing to assist. Use good cover and duck behind it often while reloading or are expecting enemy fire. The 57mm and 105mm guns carry over from the T82. If you played the M3 Lee previously, the Chrysler A57 engine will also be available immediately. All modules are mountable without upgrading the suspension, so most players go straight for the 76 mm AT Gun M1A1. The U.S. Army expressed a need for a vehicle capable of stopping and destroying enemy tanks. The new vehicle, dubbed the "Tank Destroyer", would have the same armor protection and general mobility of a standard tank, but would be heavily armed with enough punch to decimate enemy armored formations. Up until 1941, the only vehicles available were modified trucks and half-tracks, which lacked greatly in the mobility, firepower and armor departments. During the summer of 1941, Baldwin Locomotive Works began development of a vehicle to fill the need for a true tank destroyer. They began with the chassis of an M3 Lee medium tank, added a modified superstructure with an open, hexagonally-shaped top, and armed the vehicle with the M1918 3-inch gun. 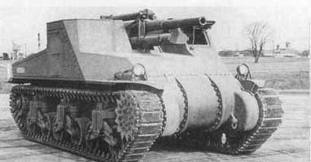 The Ordnance Department accepted the vehicle for testing at Aberdeen at the end of the summer, designating it the T24 gun motor carriage. However, the extremely high silhouette of the vehicle was thought to detract from its ability to stalk its prey, and gun was found to be lacking in range and accuracy. The T24 was returned to Baldwin for adjustments. 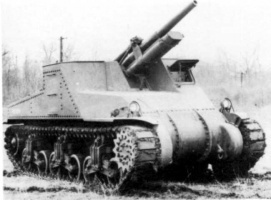 What Baldwin later returned to the Army was basically a somewhat improved T24. Indeed, it was the T24 pilot vehicle, simply modified with a slightly lower superstructure and some minor improvements to the weapon and related systems. The vehicle was accepted for testing at Aberdeen once more, this time under the designation of T40. The Ordnance Department was still far from impressed, but a surprise attack on Pearl Harbor by the Japanese, and the subsequent entry of the United States into the war prompted the vehicle's adoption as the Army's first standardized full-track tank destroyer. It was christened the 3-inch Gun Motor Carriage, M9, and a production contract was awarded for 1,000 examples. However, as the vehicle was not truly up the Army's standards, the contract was cancelled only four months later, in April 1942. The M9 had simply proven too slow, and furthermore, its 3-inch main armament was not available in sufficient quantity. 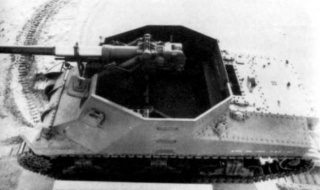 As the vehicle had a basis on the M3 Lee medium tank, the silhouette was also above the minimum for a vehicle intended as an ambush predator. The Tank Destroyer Board finally abandoned the project at the end of the summer of 1942, officially due to the insufficient mobility and speed of the vehicle. This page was last modified on 4 June 2016, at 23:58.